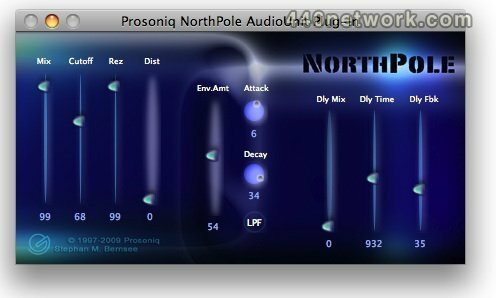 NorthPole is a free effects plug in. It adds a fully programmable virtual analog synthesizer filter with resonance, envelope follower and an integrated post-filter digital delay to your audio production environment. NorthPoleTM requires a pre-installed copy of Apple Logic 8.0 or higher or any other fully AudioUnit compatible software running on an Apple PPC or Intel Mac under MacOS X 10.4. or newer. Added 32/64bit Cocoa native version. This fixes a permissions problem and works without crashing on MacOS X 10.5 and 10.6. Ported everything to 10.6 and Xcode 3.2.4. Fixed problem with Carbon/Cocoa overlay. Cleaned up code. On Carbon-only hosts holding down the "control" key while opening the plug in editor now displays the user interface in a separate window. NorthPole's UI has now been improved to work with a larger variety of Carbon-only hosts, such as DSP Quattro. I've liked this plugin since like 2002 when I first found it. Great that these guys keep updating a free plugin, even when it isn't broken! 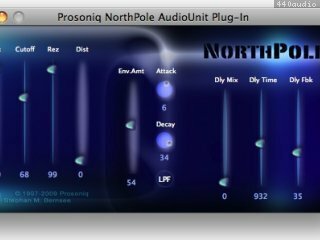 J'aime aussi ce plug mais je ne comprends pas pourquoi ce FREEWARE doit se connecter au site de prosoniq? Connection to support.prosoniq.com on TCP port 80 (http). Connection to www.prosoniq.com on TCP port 80 (http).